It takes a village to raise a child, right? As our economy has slipped, it's no surprise to see people coming together to help one another more. It's about a real sense of community; your tribe, so to speak. So, it's not a surprise, either, that our final color trend pulls from tribal influences. When I think of "tribal" I think of a variety of things. The actual color trend is that of deep browns, coppers and bronzes, rich oranges and deep reds. Texture and pattern plays a large roll, too. Rich hued natural woods, papers, and fibers all work well. Personally, when I think of this trend, I imagine a beautiful African tapestry of rich browns, tans and black. Those colors may feel a bit dark for a nursery but consider a creamy off white color with accents of browns, black, and metallics. 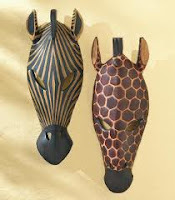 Tribal masks may seem a bit scary, too, but consider those that are giraffes or zebras. A shade for the window made of natural materials like bamboo help to the pull the theme together. If African tribal isn't to your liking, it's okay to stray from the color trend while still keeping a tribal theme. Why not travel to the jungle? Imagine yourself in the Amazon rain forest; surrounded by the lush deep green canopy and the brightly colored birds and butterflies. It's okay if you break the rules of reality and include animals that don't really live in the jungle, too, like lions and elephants and giraffes. Your little Tarzan or Jane will learn the truth soon enough. A belly facial? What the heck is that?